VR Lubricator tubing hanger vertical intervention > PTC - Well head, Gaslift, and Chemical injection for improved well performance and integrity. Avoidance of an extensive, risky and costly milling operation. The 1380 Lubricator Tool was able to operate and complete the job vertically in an efficient, safe and controlled manner. In 1989, well A44 on the Beryl Alpha platform was completed. By 1996, the tubing had collapsed and the well was killed. A Cameron H2, 5 1/8" – two way check valve, was then installed in the tubing hanger thread profile. The valve installed needed to be removed to accommodate a workover after 18 years in operation. Attempts to remove the valve in August 2014 were unsuccessful. 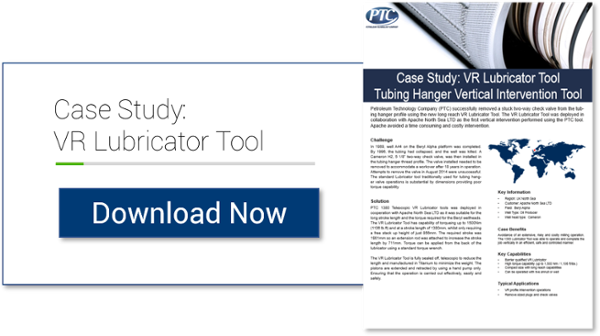 The standard Lubricator tool traditionally used for tubing hanger valve operations is substantial by dimensions providing poor torque capability.